Condition monitor your high value and production related equipment to reduce the cost of maintenance, repairs, and downtime. Our ready to deploy condition monitoring (CM) kit can be retrofitted on your plant and machinery to help save millions of dollars through a proactive asset intelligence management system. A. Asset intelligence means, providing additional machine information on legacy equipment to enable understanding of the operating environment. Q. Can you provide any other industries where the condition monitoring kits can be put to effective use. A. We have built use cases and dashboard for outdoor and greenhouse farm monitoring, industrial warehouse monitoring, cold chain management, hospital operation theatre monitoring etc. A. Functions can include information such as CO2 levels, pressure, temperature, relative humidity, 6 axis motion, vibration, tilt, noise levels, ambient light, air quality, acceleration, liquid levels, soil moisture, pH levels etc. Q. I want to monitor the energy management of certain equipment at my warehouse. A. Yes, we do have a module to monitor power consumption and display the information on our integrated dashboard. A. Prevention is better than cure. Cost of breakdowns and nonscheduled maintenance do cost money to upset the operating budgets of factories. Using our machine data dashboards and data visualisation tools, shop floor managers will easily be able to detect abnormalities in equipment behavior, which in turns allows them to take proactive measures. A. The versatile dashboard provides instant values from various sensor functions, alerts on abnormal values, graphs and charts based on daily or specified date range, email notification, fault detection, abnormal vibration readings etc. A. It would not take more than 15 minutes to install our kits, and the machine data values will start showing in a few hours after due calibration. We use double-sided adhesive tape to attach the sensor module on to your legacy equipment. A. Site inspection, understanding the requirements on machine data collection, configuration sensors and dashboards, understanding analytics needs, deployment of sensor modules, calibration, test run and go live. A. Our retrofit wireless analytics solutions can be deployed on Intel NUC and Dell Edge gateway devices. Using HDMI cables, the dashboard can be shown the information on TV screens. Q. Huh. Is the data on cloud. We are worried about security and privacy as we operate in a restricted zone. A. No worries. Our condition monitoring solutions can be deployed on-premise edge gateway devices and would not require an internet connection unless you want the data on your enterprise cloud storage. A. Our sensor modules need to be installed on each of the equipment to be intelligence enabled. Q. So this gadget of yours sounds like a Fitbit for legacy equipment. A. That is true. Vital statistics of your legacy equipment will be constantly transmitted for your operations and monitoring teams to take action. A. We have incorporated anti-tamper and theft mechanism which provides alerts if anyone tries to forcefully remove the module from the attached equipment. A. You have a choice of direct power, battery and solar panel depending on the location of the equipment. Q. Please give examples of equipment on which RipplesIOT retrofit solutions can be implemented. A. We have engineered the solution with diagnostic tools to ensure self-service. We ship globally and the products are warrantied for 2 years. Q. Can I see a demo of your dashboard and data visualisation tools online. A. 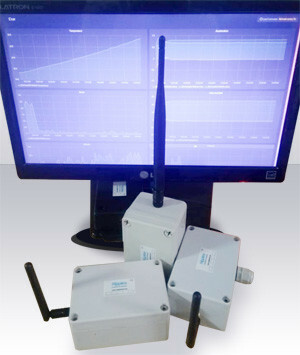 Certainly, you can put a request on our industrial monitoring demo page or chat with our representative. Q. We already have few process data running in a manufacturing suite, can you integrate and push the condition monitoring data to the same? Q. Can we set rule-based alerts from your centralized monitoring system? A. Yes, you can read about the sensor module specifications related to standards, wireless emissions etc. Yes, we can enable the gateway devices with mobile connectivity to monitor in real-time, the condition of in-transit cargo.